We derive a general spherical wave multiple scattering expression of the EELS cross-section. 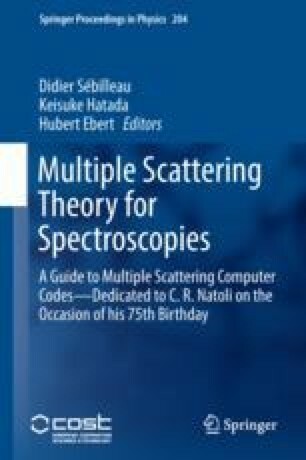 Contrarily to most of the previous theoretical frameworks, this approach treats all the electrons involved on an equal footing with respect to multiple scattering. The main point in our results is that the cross-section depends not only on Coulomb integrals on the absorbing atom, but also on contributions from all the other atoms. We show that these external contributions should be restricted to neighbouring atoms.